Five-to-six students may be accepted annually for the clinical practicum that begins the third week of August and continues into May. The first week of the clinical practicum is spent in orientation. This includes an introduction to the program, a brief orientation to the various departments and staff of the Clinical Laboratory, a tour of the medical library, a review of schedules and policies, book distribution, and pre- clinical competency testing. Classroom lectures are given in the areas of Phlebotomy, Microscopy, Safety, Infection Control and Universal Precautions, Medical Terminology, and Computer Orientation. Students are scheduled from 0600-1430, 0700-1530, 0800-1630, or 0900-1730 depending on the departmental rotation. There are limited optional educational experiences available on the PM and/or night shifts during the elective week at the end of the program. Two or three hours of classroom lectures are given each Monday, Tuesday, Thursday, and Friday afternoon by Pathologists, Laboratory Management, Section Specialists, Program Director, or staff technologists. The remainder of the time is spent in the various sections of the clinical laboratory on a scheduled rotating basis. During Orientation students will receive a handbook detailing general policies of conduct, attendance, grading, evaluation procedures, and grievance policies. 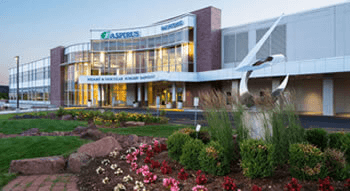 Students are required to follow a dress code appropriate to the professional work involved and within the guidelines required for employees of Aspirus Wausau Hospital. Biologic safety lab coats are provided by Aspirus Aspirus Wausau Hospital. *This fee is currently $1000.00 per student. It may change without notice. Some of the textbooks used during the clinical practicum are available free of charge on a loan basis from the program. Other required textbooks must be purchased for approximately $100 to $300 (total cost). The cost of national certification examinations are the responsibility of the student. Housing needs vary with the student's own preference and are the complete responsibility of the individual student. Students are not required to be in attendance on the following holidays: Labor Day, Thanksgiving and the day after Thanksgiving, Christmas, New Year's Day, Good Friday, Easter and the day after Easter, and Memorial Day. Vacation is granted during the week between Christmas and New Year's Day. The progress of the student is continually reviewed with reports sent to the university each semester. Grades will be forwarded to the university at the completion of the clinical practicum. A minimum grade of C and/or satisfactory performance is required during classroom lectures and departmental rotations. Financial aid is not granted by Aspirus Wausau Hospital. For students from affiliated universities, financial aid is available to qualified students through the Office of Financial Aid at their respective universities. A pre-enrollment physical is required of all accepted students. For complete details contact the program director. Health insurance is not available through the hospital unless a person is employed by the hospital a minimum of 20 hours per week. We strongly suggest that during the clinical practicum students have their own health insurance or a means of payment in the event of illness or injury. Employee Health Services are available to the student during class hours should the need arise, and Emergency Room facilities are also available in an emergency situation. The student must notify the Program Director as soon as possible when an absence is necessary. Absences due to illness during the program may require make-up assignments, including special projects and addition assigned time in the laboratory. Failure to maintain a grade of C and/or satisfactory in classroom or laboratory instruction. Negligence, especially with regard to treatment of patients. Failure to comply with program or hospital policies. Students from affiliated universities should consult their university catalogue. Non-affiliated students should submit a request to withdraw to the Program Director. A 50% refund of tuition fees paid will be made if withdrawal is prior to November 1st of clinical practicum. Textbook fees are not refundable.